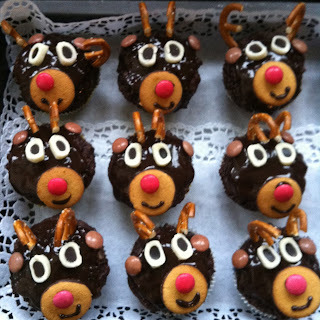 As my birthday is in December, I am lucky enough to make lots of great winter- and Christmas-themed treats for my birthday parties - including these reindeer muffins that I had discovered on Pinterest and the Melting Snowman Cookies following in the next post... the basis for these muffins are my very first chocolate muffins, but you can use any muffins you like! 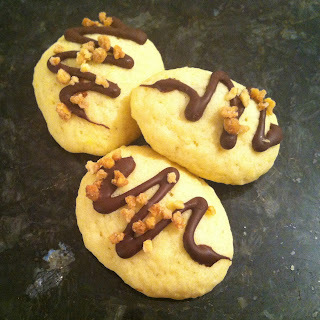 This recipe for cashew toffees, just as the as Nougat Cookies, from my very first Brigitte Cookie magazine, and I als modified this recipe slightly. Cooking the condensed mass is a little difficult, you really have to be careful that nothing burns and stir all the time, and if the mass has not thickened enough, it bubbles up in the oven, takes a long time to solidify, and sticks very much at the cutting. But with some practice, it works quite well and the toffees are just so amazingly tasty that I take the trouble every year - I can really recommend them! 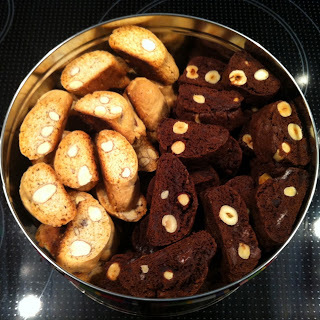 Yeah, okay, actually it's not Nadine's Nougat Cookies but Brigitte's, because the recipe for it from a Brigitte Cookie magazine several years ago, just like the following recipe for cashew toffees. They have these cookie magazines each year, but these two recipes are my absolute favorites and almost always when I can choose a recipe for a cookie-baking sessions with girlfriends, I make the nougat cookies or cashew toffees ... and usually both! I slightly modified the Brigitte recipe, see below. For the birthday of my world best sister, I made a handbag this year, as a voucher for a real handbag, and matching cycling shoes as a gift voucher from her boyfriend. I had planned to make red velvet cake, but I didn't have enough red food coloring left, I thought purple would be nice - that is, I used red and blue paste color and purple powder color. Well, as you can see, all that made a pretty velvety brown... at one point, however, you can see a little purple streak ;-) I was not that happy with the used recipe and with the resulting cake falling badly in after baking, but everyone else thought that it tasted good, so all's well! 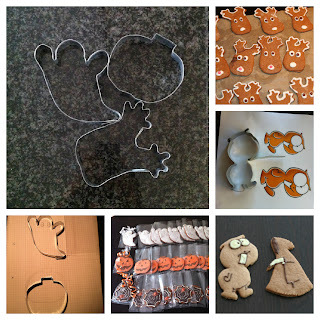 Like so much else, I discovered this cute and easy way of decorating cookies on Pinterest. 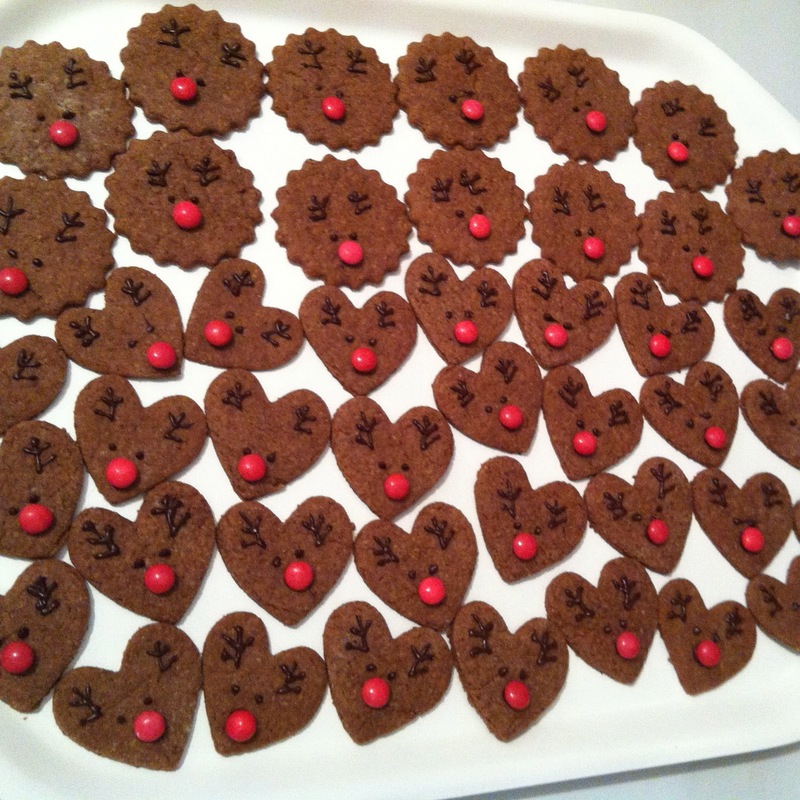 My reindeer are (intentionally) darker than thanks to cocoa in the dough, and I thought a heart shape would be nice - even if that lead some onlookers to mistake the heart-shaped ones for "Reindeer mice" and the jagged ones for "Reindeer hedgehogs"! If you decorate as many cookies as I did, it takes time despite the simplicity ... but it was worth it, right? And you'll have many cookies to hand out, which is always good. 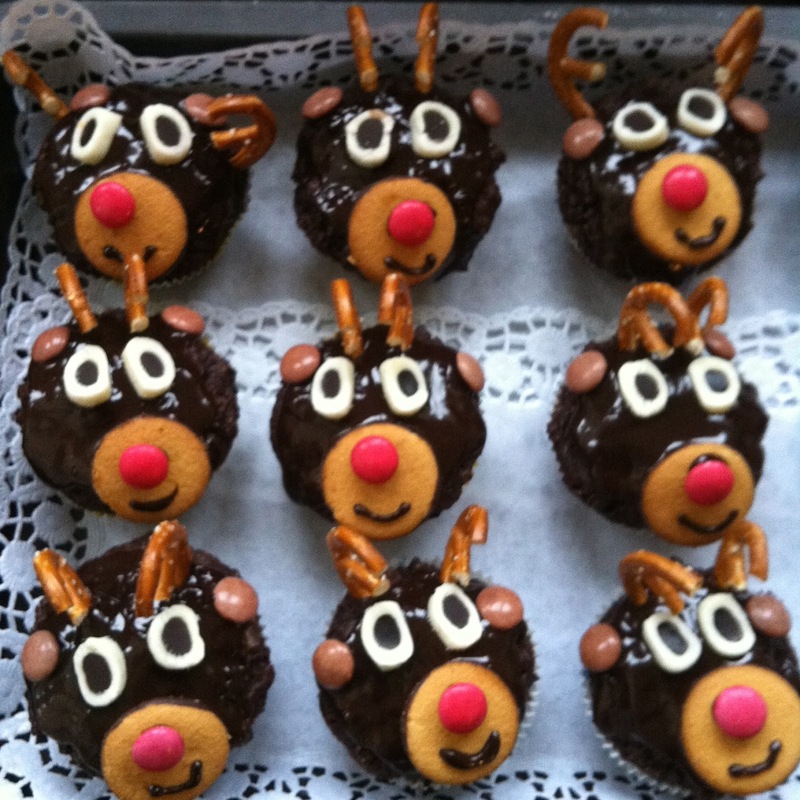 :-) I used the same dough as for the non-lemming Funny cookies . I had a Halloween party planned for his year and a lot of ideas of what I wanted to prepare for it. After this plan had changed spontaneously, I was invited to a Halloween party at a dear colleague's house and chose these bat muffins from all my ideas as my contribution to the finger food buffet. 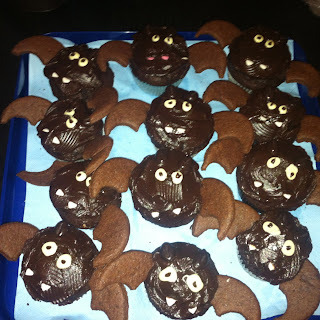 Mine are not as cute as the original ones with mini muffins and huuuuge eyes , but they also look a bit halloweenig and nasty, as it should be! The very first muffins that I have ever baked come from a long-forgotten recipe book which a school friend of mine had once borrowed from the town library. Yes, back then we had no Internet! In the meantime, the recipe had disappeared, but I found it again and think it's still as good as ever. 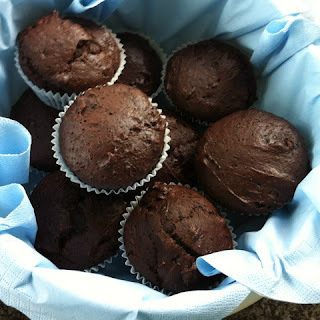 Sophias Quick Chocolate Muffins are very similar (except for the more fluid dough ) because I had then tried to reproduce the lost recipe from memory... So, here come my very very very first chocolate muffins! Tadah! 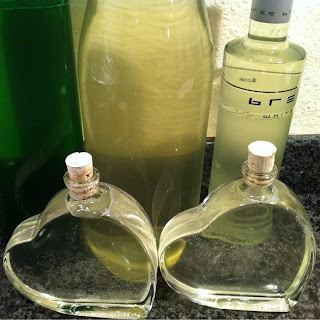 Since both my elderflower syrup and my lilac syrup have been emptied or given away for a long time now, I was happy to realize that nature has cleverly built the elder in such a way that you get your second chance and can make elderberry syrup from August to October! Like the other syrups, elderberry syrup is excellent with sparkling wine, prosecco, mineral water, ice cream and other desserts. I still knew the elder picking places, thus I set out to collect some berries on a sunny bike ride home. Well. Turns out that the biggest and ripest elderberry clusters are hanging high up, where it's nice and sunny and impossible to get there for the picking them. I managed to get some, and even experimented with different methods of juicing and made ​​two batches of elderberry syrup... because elderberries are healthy, high in vitamin C, boost the immune system, and can even be used to reduce fever, says the Internet - I will test that some time! Sweet Pesto of Mint und Lemon Balm - and Chalkboard Lids! Hurrah! I have found a very effective way to use my tide of mints and lemon balm from my herb garden, and at the same time, to preserve them in a very tasty way: Pesto! Pesto can also be sweet and makes an excellent contrast to desserts such as panna cotta, crème brûlée, ice-cream, and more or less everything! I also tried a new technique for labeling glass jar lids: painting them with chalkboard paint! It is very simple and even dishwasher-proof! Lately, it seems that stick bread has gotten very popular again, and since I missed this trend as a child, I really wanted to try it! Last weekend, we were invited for a barbecue and our gift in addition to the lemon meringue cupcakes was dough for bread on a stick. Today is my best friend Fabian's birthday, and since he loves the Notfunny Comics by Joscha Sauer and always likes to present us with a Notfunny book or postcard calendar, my sister had the idea to bake him cookies and to send them together with a Notfunny postcard. 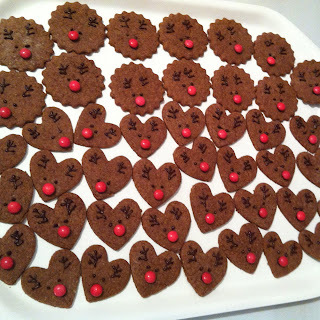 And because I always love to stay in theme, I wanted to bake Notfunny cookies! Since the summer seemed to be over for a while, I started into the tea-season. In addition, my pineapple sage just grows and grows, taking resources from the other herbs, such that I'm trying to use a lot of it right now. ;-) Apparently, it really likes my herb garden, much more than the other herbs, which grow normally and much slower! you can make a delicions tea from pineapple sage, which even tastes much better than sage tea - but it's also not as healthy as sage tea. I won't use it up all, though (apart from the fact that I won't be able to drink THAT much tea) - the red flowers of the sage are supposed to be very pretty! As I proudly announced in the previous Post, I participated for the first time in Post aus meiner Küche - I think the idea is great! You get assigned an exchange partner, whom you can clarify food allergies with, and then mails each other parcels with self-made delicacies. Also, photos of the delicacies get pinned onto the matching board on Pinterest, which reflects the motto and visualizes a virtual picnic meadow. Genius! Check it out, there are great things to see and a lot of inspiration to be found. And it's all packed so prettily! 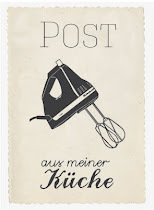 For the picnic exchange of "Post aus meiner Küche" (Mail/Post from my kitchen), I wanted to create a new and fancy recipe. Since my exchange partner said that she loves the Blueberry Tarte in my blog and blueberries in general, I wanted to make something including blueberries. And as I've wanted to try cake pops for a while, and thought they were nice and small and compact and well suited to mail them, I created this recipe. I was very excited to find wooden popsicle sticks in my DIY cupboard as well as a coated wooden board in the perfect size which already had 4 holes in it and serves perfectly as a cake pop holder! I made more lemon curd than I needed for the 12 cupcakes - although it keeps only for a few days, I decided to keep some in the freezer and use some as a bread spread or for the next batch of cupcakes. It's delicious! Visiting my parents together with my dear sister, we could harvest a lot of lavendar which we used for lavendar pillows and this great jam (of course, the composition was my sister's idea!). The flavours of strawberry, vanilla and lavendar harmonize even better than we'd thought! On my daily bike trips to work via the rural outskirts of Munich, I enjoy (apart from the many wildflowers) the idyllic landscapes with fields of cereal grains. It's really great to watch as the fields change their color over time from a soft green to a full yellow, until at the end, there are only cute little hay bales left. And since I do use different kinds of flour for my baking, I thought I should blog about the kinds of grains and other foods growing on the side of my daily route! From yeast dough, you can braid almost anything, and for the beergarden, you always need a basket. This gift basket for a birthday in a beergarden couldn't truly be used for the transport of the contained food, but at least it provides a pretty setting! The dough is exactly the same as the one described in the Pretzel dough post, it's very easy to work with. I've loved Pretzels since I was a small kid. After spending some time in Bavaria, I realized that there are subtle differences between Bavarian and Swabian Pretzels - the Pretzel arms are thicker and sit higher on the Bavarian Pretzels, the Swabian Pretzels have a bigger "belly" that is cut open so that there is a well-defined white spot on them while the Bavarian Pretzels just burst at some random place. 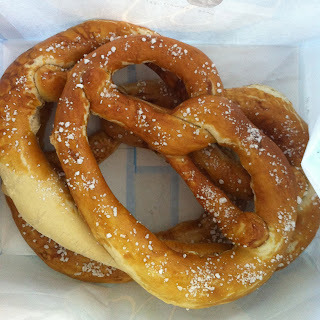 ;-) My big Oktoberfest Pretzels are Bavarian Pretzels. You could tell, right? Concerning the lye, there are heated discussions online whether sodium hydroxide (NaOH) or sodium carbonate solution(Na2CO3) is better to use. I tried both, but the big Oktoberfest Pretzels can only be made with sodium hydroxide, as you need to boil the pretzel for a bit in the sodium carbonate solution and that won't work for Pretzels this size. For normal-sized Pretzels, it works well, see below. For these Pretzels, I used light spelt flour (type 630), which is similar as wheat flour type 550. From this amount of dough, you can make 16 normal-sized pretzels instead of the 4 Oktoberfest Pretzels, or one Pretzel Basket! Today, the weather for plucking blueberries was perfect, so this is precisely what we did with relish under a bright blue sky... Blueberrys are much easier to pluck than strawberries, as you don't have to scoot around on the ground but have the berries in a great ergonomic height, practically falling into your basket! And they're so healthy! As we'd been invited to dinner spontaneously, I spontaneously tried once again to make a sponge cake base for fruit cakes myself - that mold is another one that the cake usually refuses to come out of! But then, it enables you to bake a cake base on a sunday, when you cannot buy one, and you can add ground almonds to make an almond sponge cake, which you cannot buy at all! And that's how I had the idea to preserve my great crop of mints this year combined with Elderflower Syrup in frozen "Hugo-Cubos": Icecubes to which you only have to add prosecco and maybe a little lime for the trendy Italian summer aperitif Hugo- such that you can enjoy it in winter, too! :-) As an alcohol-free version, you can combine the Hugo-Cubos with Tonic Water and Soda! Watalappam is my Dad's favorite dessert and is usually made once a year for his birthday. The pudding containing palm sugar and coconut milk probably originated in Malaysia, but has grown very famous all over Sri Lanka by now. Its most exotic ingredient is "Jaggery", a very dark brown sugar made from date palms. It is sold in half sphere shaped lumps, usually only in Indian Asia Shops as opposed to Thai Shops. 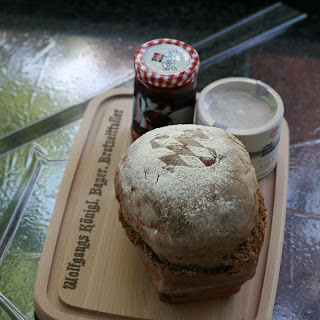 My clever sister has discovered something great once again: the Hermann sourdough! The English Wikipedia calls it Amish Friendship Bread. When we were kids, we used to have it, a fun combination of chain letter and Tamagotchi ("I have to go home and feed my Hermann"), but back then, we didn't know the delicious recipe for Cinnamon Buns (German) yet. I like these Cinnamon Buns better than all the other Hermann cakes - it may be due to the cardamom, which is typical for original Swedish Kanelbullar. For the Hermann base dough, there are recipes without yeast, with yeast, or a recipe for cross-breeding a different sourdough (all German). I follow the recipe rather closely, I just take a bit more of the Hermann and use milk instead of an egg to brush the buns. I also don't sprinkle the buns on the tray with cinnamon and sugar, but I have tried to add the traditional Swedish sugar crystals with great succes! My good friend Timo has a very successful German Podcast about technical gimmicks called Bits und so. 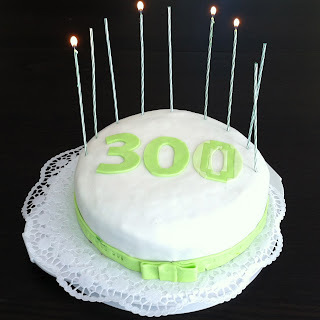 Yesterday, they had a big event for Episode 300 of the podcast, which was recorded live in Munich, and I thought a matching cake for such an event shouldn't be missing! Contrary to popular prejudices, these circles have progressed to drink Club Mate instead of Coke - that's why I found, test baked and adapted this recipe (German). I made my first decorations with marzipan, powdered sugar and food coloring, then I discovered Marshmallow Fondant and finally this fantastic Gelatin Fondant (German recipe). Wikipedia says: "Fondant (UK: /ˈfɒndənt/, US: /ˈfɑndənt/ or /ˈfɑndɑnt/, from the French: /fɔ̃.dɑ̃/) is one of several kinds of icing-like substance used to decorate or sculpt pastries." In the comments to the recipe, they talk about a caramel syrup, but since I couldn't find it in Munich and since I tried very unsuccessfully to use "Grafschafter Rübensirup", I settled on using this easily made Glucose Syrup (German recipe). 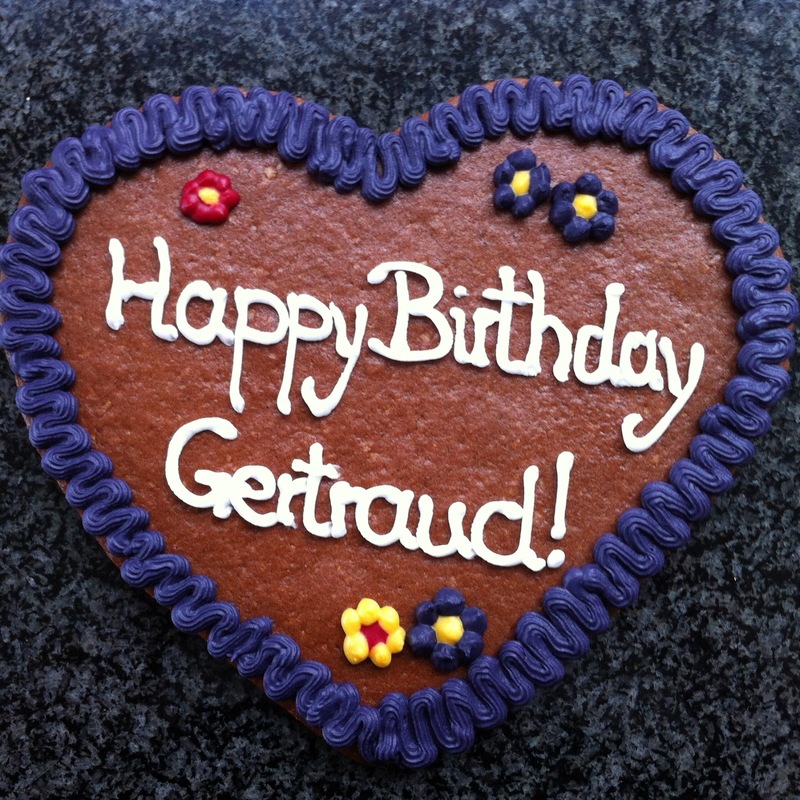 Since I am preparing a cake with gelatin fondant, I made the fondant today to use it tomorrow. 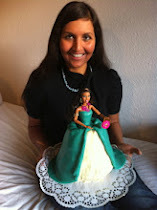 Gelatin Fondant is less tough than Marshmallow Fondant, it can be kept for quite a while in the fridge or frozen and doesn't taste too sweet (for fondant, anyway). I can really recommend it! 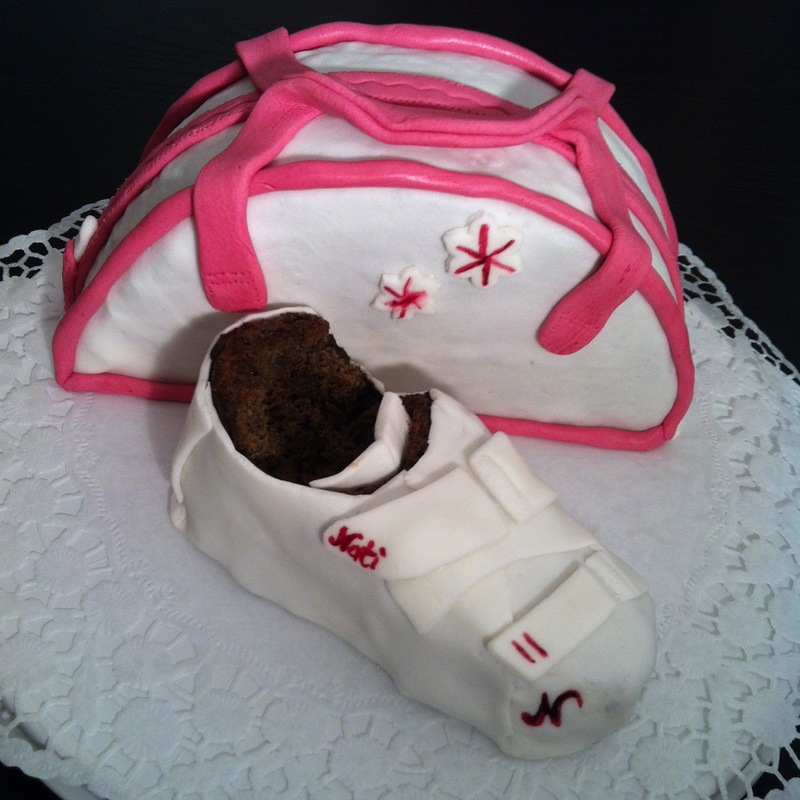 I created this gateau especially for the wedding of our friends Raphaela und Martin - my best whishes for you two! The YinYang symbol stands for the union of complements or opposites to harmony, for man and woman, dark and light. 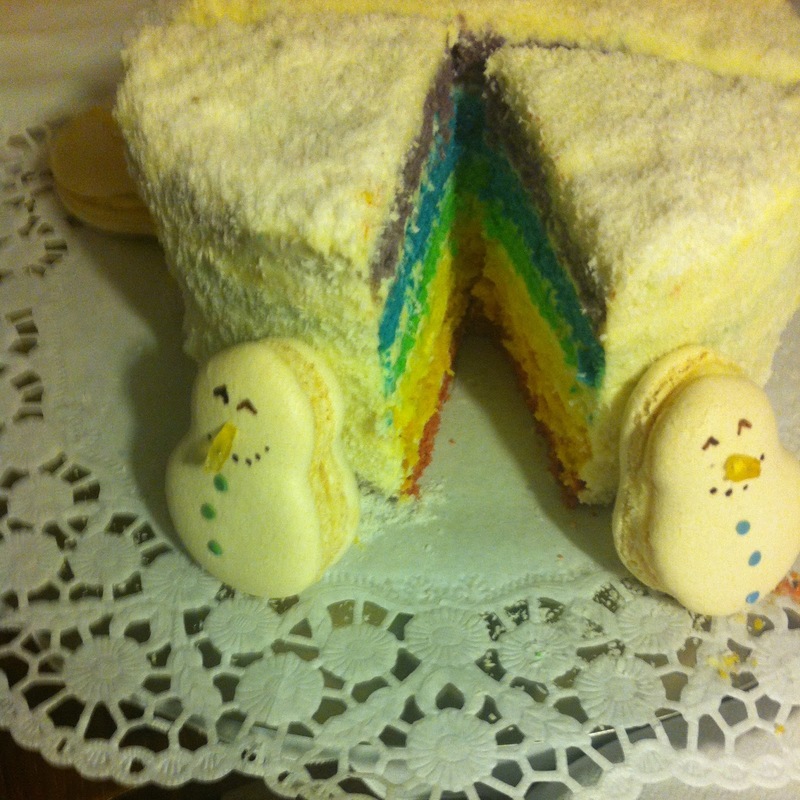 You can prepare this gateau perfectly as a couple - each person just chooses a color, prepares the sponge cake and the mousse and in the end, everything is combined in perfect harmony. 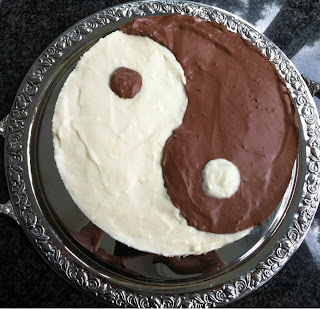 :-) You can also combine the gateau diffently in order to exploit the opposites: since the white mousse is a bit sweeter, it also tastes very well with the dark sponge cake! Chocolate Filled Strawberries - the other way! This time, I've found an elderflower tree which was situated in a less dangerous environment (far fewer ants!) 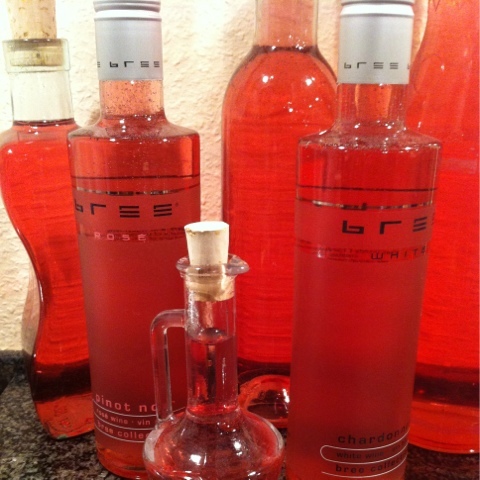 and escaped unharmed - that makes the Kiachl taste eben better! We had potato bread accompanying a menu of 3 courses in a fancy restaurant once and loved it, and while trying to find a recipe for that potato bread, I discovered Chefkoch.de. 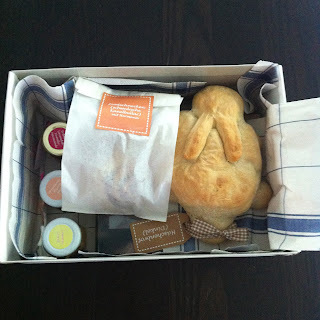 So this is the very first of many recipes that I got from Chefkoch.de, and a good start it was! 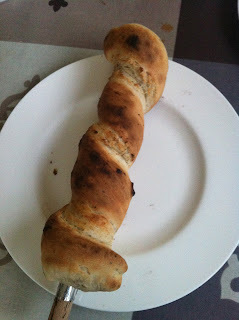 The bread is very easy to bake and always turns out delicious for me. You can keep the ingredients on stock, such that you're always prepared for the spontaneous barbecue party on Sunday afternoon when bread is nowhere to be bought - and in addition, I think no other bread better suits a barbecue than this one! I made a little change to the Chefkoch.de recipe, so this is my variant described below. For our niece's first birthday, I made chocolate muffins with toy building blocks made from edible play do. 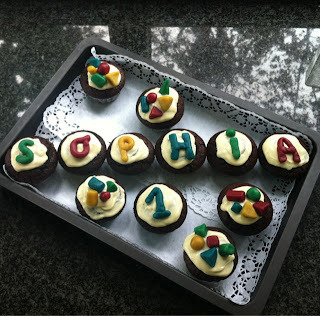 She didn't eat any of them, however, apparently she's one of these strange children who like only healthy food - no cake! Well, she's not related to me, otherwise it would be even stranger ;-) I used funny colorful paper muffin forms instead of the baking paper squares for a change. They muffin forms are also better for seeing the decorations of top of the muffins! 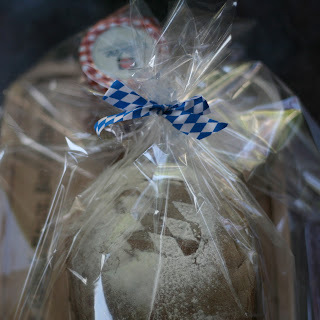 I love "Bread and Salt" as a present for someone's housewarming party - you can always use it, even if many guests had the idea to give you bread and salt, and the symbolism (the bread stands for food, the salt for wealth) is also nice. The German saying that goes with it is "Brot und Salz, Gott erhalt's" ("bread and salt, may god keep it for you"). If you want to gift-wrap the bread and salt in a traditional way, a wooden cutting board serves nicely, and here in traditional Bavaria, everybody loves a "Royal Bavarian Snack Plate". Since I had seen one of these readymade only once (during Oktoberfest) and I thought it would be nicer still to include the host's name, I made the plate myself this time. The Bavarian coat of arms shouldn't be missing, so I decided to put it on the bread. I baked the bread in the wooden baskets from here, and I included a jar of Rhubarb-Strawberry-Chutney, as we were invited for a barbecue. Sometimes, the baked works of art require an adequately fancy presentation and today I want to introduce one way of creating such a presentation: I call it solder-burning, using a soldering iron to burn shapes into wooden objects. I had the idea when I wanted to make little markers for my herb garden out of wooden popsicle sticks, and some of these popsicle sticks already have this kind of burnt print on them. Since it worked very well with the popsicle sticks and I recently needed a "Royal Bavarian Snack Plate" to present the "Bread and Salt" for a friend, I thought it was a nice idea to also write his name on the board and progressed to the next and rather bigger object - check it out! The name Chutney comes from the Indian cuisine and refers to a family of condiments, often involving spices and fruits. Chutneys used to be prepared fresh until the British adopted the custom of preserving chutneys using sugar and vinegar, similar to the principle of preserving jams. 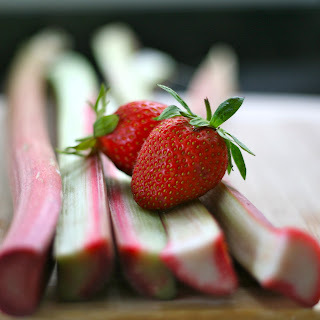 With strawberries that you harvest yourself, the chutney tastes especially delicious! All chutneys are a great condiment for grilled meat, but also for cheese and fish or Rice&Curry dishes of the Indian and Sri Lankan cuisine! Finally, the elderflower blossoms, and this year, I had to pay quite a price for the syrup. It happened that I discovered a wonderful, huge elder tree just on my way home from work, which was laden with elderflowers just in my reach. I happily started plucking the umbels and was so absorbed that I only got a strange feeling as something crawled into both my ears. What could be a better decoration for a mango mousse than a chic chocolate cup? At least that's what I thought this morning. 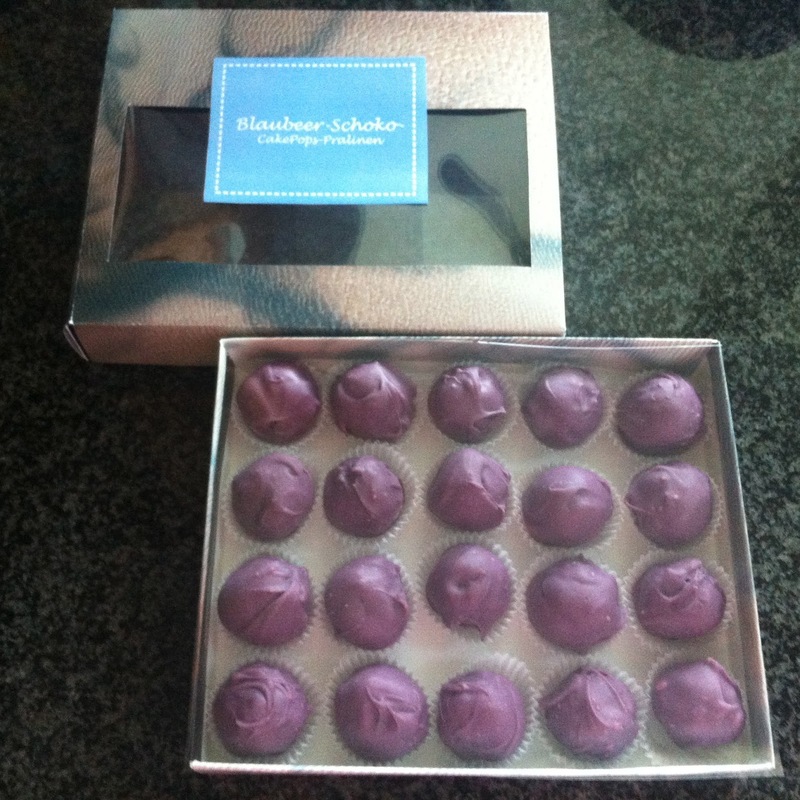 I'd seen the great idea of making chocolate cups out of air ballons in this blog, and wanted to try it. Unfortunately, I hadn't read the comments beneath the post, these ladies had had similar problems as I experienced - we had chocolate in our faces (and splattered across the whole kitchen) instead of on the rack! 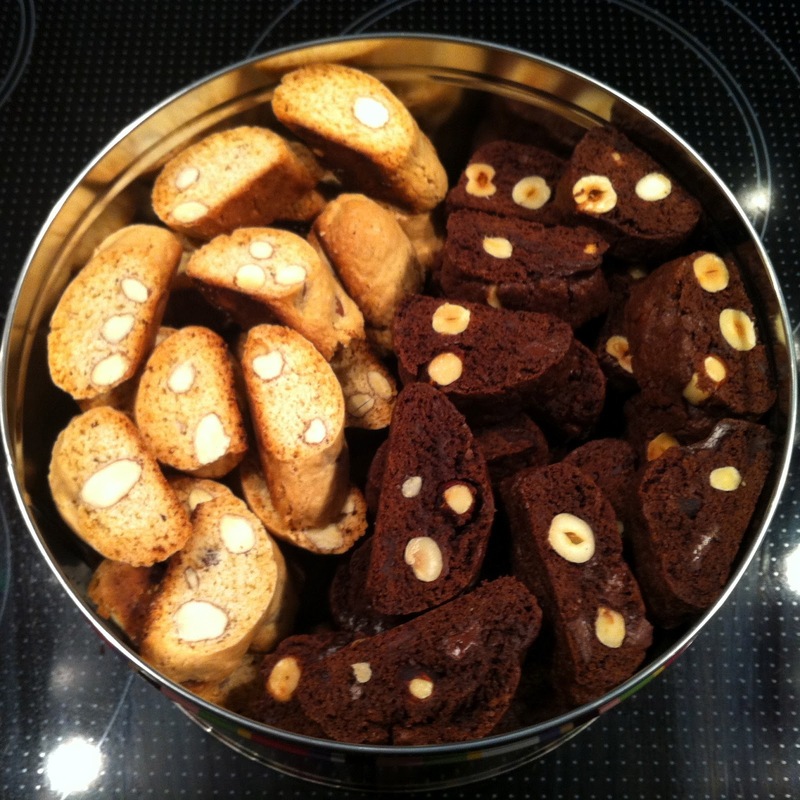 This year, my sister and I couldn't visit our parents for Mother's Day, so we sent our Mum baked italian cookies via mail: Biscotti alle Nocciole, cookies with hazelnuts, and toscan almond cookies, the famous Cantuccini. Since the elderflowers are still not out this year (what's in bloom right now and _looks_ like elderflowers is in fact the related snowball, which is slightly poisonous) and pink syrup is a fancy contrast, I decided to make lilac syrup. It can be enjoyed just like elderflower syrup in sparkling wine or presecco, with sparkling water or on ice cream, and it really tastes like the lilac flowers smell! 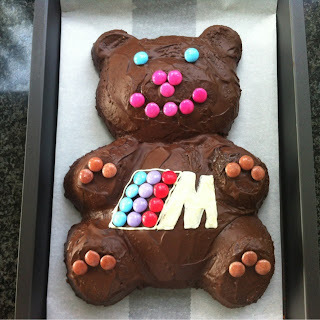 For his birthday, my boyfriend traditionally gets a cake (called Rehrücken, "deer's back" in German) in the shape of a teddy bear - ever since his parents got the bear mould in the US and his mother found out that one Rehrücken recipe fits exactly into the mould. In the last years, the honour of baking the cake fell to me, however I'll still need to practice for a while as I still have big issues with getting the bear out of the mould! This year, we had M-Bear, matching the M3 that I rented for the day in the BMW World - which I can greatly recommend by the way! This delicious and not too sweet yoghurt crème with mandarins can be served with our without a sponge cake base. Since I wanted to finally try out my half-sphere-shaped moulds, which I got for Christmas, I made the crème without a cake base. I found that the piece of apple and the balsamico crème that I used for decoration matches the yoghurt crème in taste as well as in style! This recipe for "Maultaschen", a Swabian specialty, comes from Gaby, my first boyfriend's mom, just as the Easter Wreath and many more of my favourite recipes. I'd known for many years that she often makes Maultaschen, but I always thought she made the dough herself using a pasta machine. 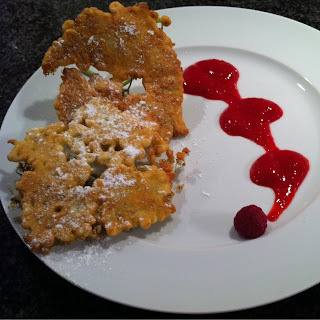 When I finally had my own pasta machine and a lot of free time as well, I called her up to ask for the recipe, and leaned to my astonishment that you can get that kind of pasta dough for Maultaschen readymade in the supermarkets of Baden-Württemberg! Here in Bavaria, a scant 200 km away, it's nowhere to be found! Of course, you could make the dough yourself, but the wide roll of dough is very handy compared to the narrow one that my pasta machine produces. 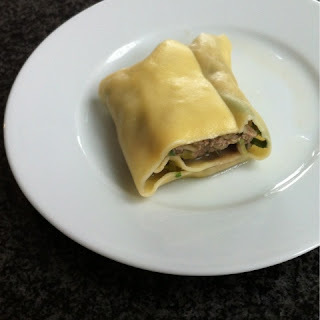 The filling of Gaby's Maultaschen is rather special, too, as classically it contains sausage meat and spinach. This filling with minced beef and leek is less fatty and I like it better. Gaby's original recipe suggests 1 kg minced beef and only one piece of leek. 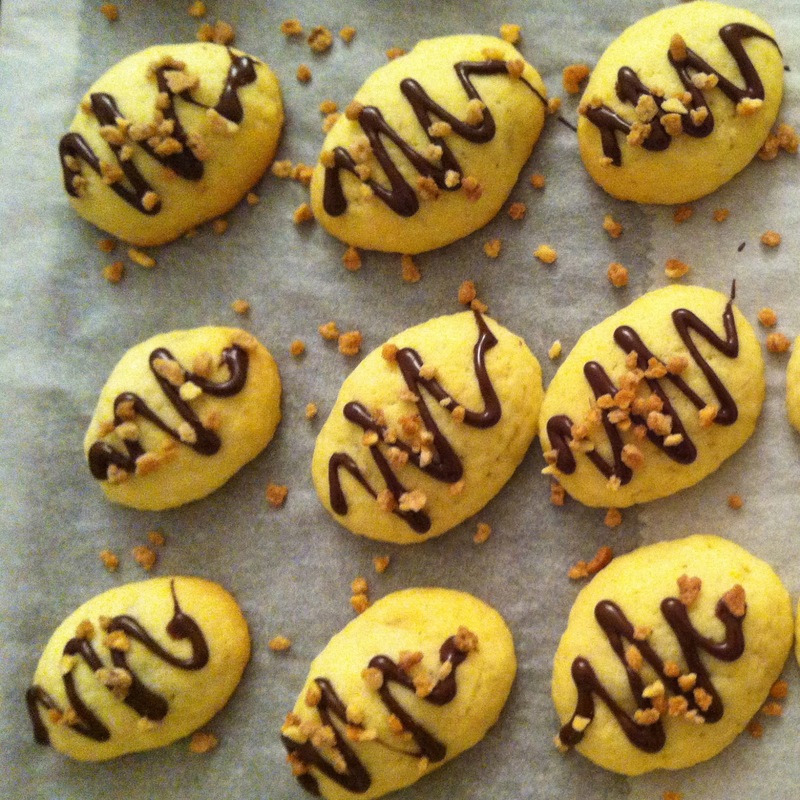 As so often with good baking ideas, it was my little sister who thought of making French Macarons au Chocolat. 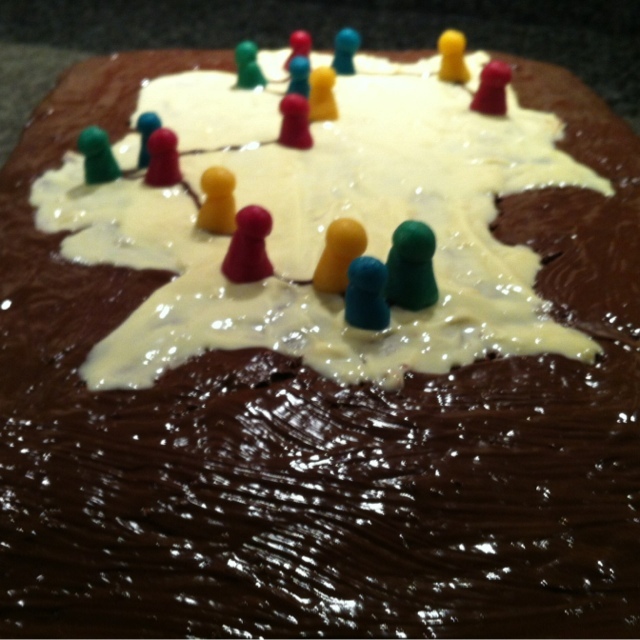 After researching them on YouTube she found this French video, where this recipe comes from (I only reduced the amount of ganache a bit). 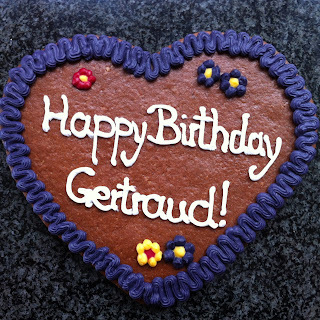 I'm Nadine, I live in Munich, and as you can see here, I love to cook and bake - especially desserts - cakes and gateaus, tartes and mousses - Pâtisserie! The cake in this picture was not made by me, but a birthday present from my sister :-) You can find me at Facebook, Twitter, Pinterest and, of course, Blogger. I'm participating! Who else is? All text and pictures in this blog belong to me and may not be used without my permission.